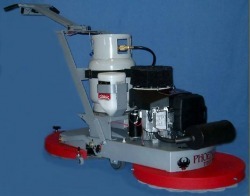 The Phoenix Titan Twin allows you to clean, refinish and polish in one step. This reduces dusting of base coats as the floor is still moist with a fresh coating when it is being burnished. Gloss is higher too because the coating is burnished immediately while it is easily moved. Dry cleaning means a safer environment in 24 hour stores plus a savings that is way beyond anything available elsewhere. This machine can be transported from one location to another much easier than an automatic scrubber and you only need one machine instead of two to complete your work.